As her illnesses grow, Queen Anne (Olivia Colman) relies more heavily on her most trusted confidant, Lady Sarah (Rachel Weisz). It has gotten to the point where the queen rarely leaves her bedroom and Sarah tends to the business of the country. As the war with France rages on, Sarah butts heads with Harley (Nicholas Hoult), who represents a group of wealthy landowners and is in charge of funding for the war. With Sarah’s influence over the queen, she is able to get her way. Sarah’s cousin, Abigail Hill (Emma Stone), shows up in search of employment after her fathered gambled away their money. She is hired, but must work among the kitchen staff and is generally reviled. Abigail eventually works her way into Anne’s graces. As time goes on, Anne and Abigail spend more time together, eventually becoming friends. At first, this works well for Sarah as it leaves her more time to focus on government matters and manipulating the path of the war. When Anne begins to request Abigail’s presence rather than Sarah’s, Sarah becomes jealous and enraged. Abigail and Sarah vie for Anne’s favor in a game that escalates to veiled and not so veiled threats. As the battle between the women intensifies, the women’s futures and their very lives are on the line. 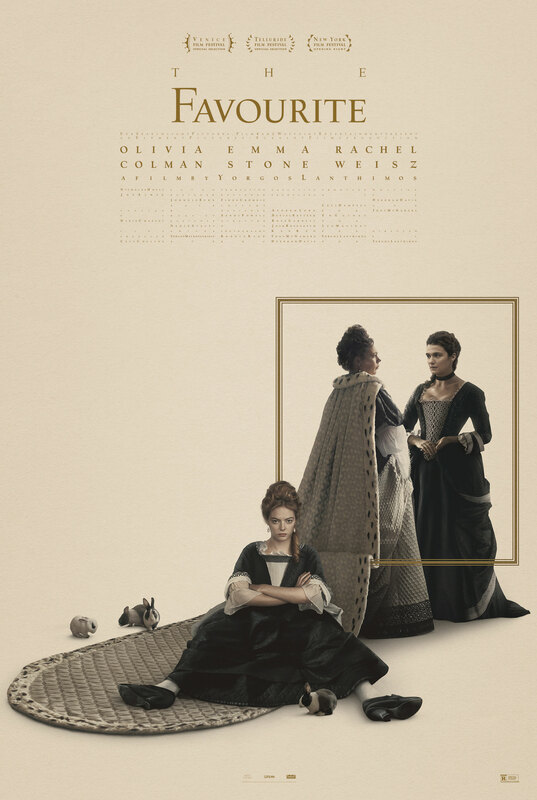 The Favourite is a period dramedy that takes you back to England in the 1700s as the British wage war against the French and against each other. While the supporting cast adds to the richness of the film, it primarily focuses on Rachel Weisz, Emma Stone, and Olivia Colman as women who lead one of the most powerful countries of the time. While Weisz’ Sarah is more blatant in her manipulation of the Queen and her subjects, Stone’s Abigail is more subtle. She plots her way into the Queen’s life, slowly replacing her cousin as the favorite. The women are civil to each other on the surface, but neither want to back down, especially when cornered. Colman plays Queen Anne who is slowly being consumed by her illnesses. She is less what you would picture as a queen and more a madwoman. However, it is only when her illness seems to be taking everything away that she finds her strength. The performances are solid from the 3 main characters. Based on actual people and events from history, The Favourite is an interesting mix of period drama, political intrigue, romance, and most surprisingly, humor. The lengths these women will go to in their scheming is simply amazing. The men are simply ancillary characters to be played and manipulated so the women can achieve their goals. While the story is well written and acted, the costumes and sets help to make the film feel authentic. Every detail has been thought through, transporting us back through time. My biggest complaint is that the score swells to an almost overwhelming level, trying to create tension when the characters have no dialogue. It becomes a bit of a distraction at times. A cast of very strong female leads, a basis on a real story, and intricate set dressing makes The Favourite an intriguing film. Some directorial choices in the final scene may be a bit questionable, but it can mostly be forgiven. Already receiving a significant amount of awards buzz, you will want to catch it in theaters so you know what everyone is talking about.